What is it about Broccoli and Cheese that makes them taste so darn good together? Anyone remember that yummy Broccoli Cheddar Soup from Panera Bread? So thick and creamy? Well, I’m happy to say I made a copycat recipe for Vegan Broccoli Cheddar Soup the other night – and it is PERFECT! It’s thick, and creamy, and cheesy, and loaded with a ton of broccoli……..just like the real thing. Of course, there’s not really any cheese in it….. Instead, I use a medley of vegetables and spices to give it that yummy Cheddar Cheese flavor. And although the original soup was probably never labeled as a healthy soup, I can guarantee you this one is! Sounds more like Vegetable Soup, doesn’t it? 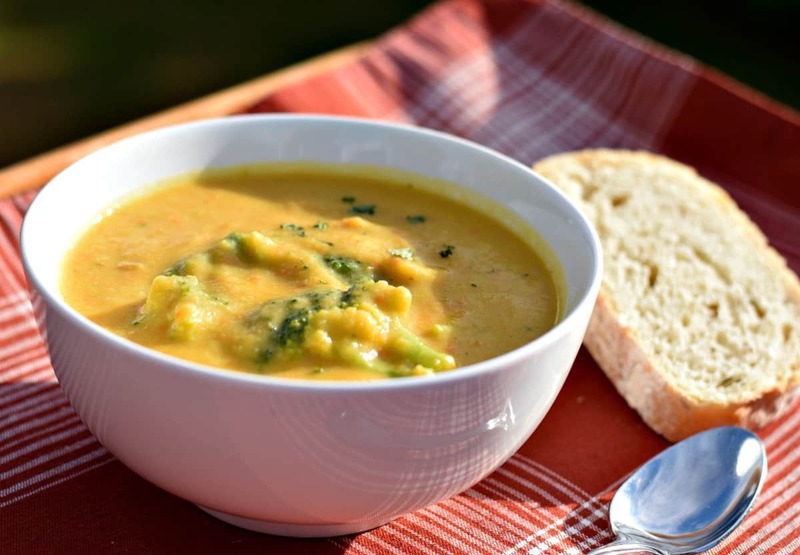 But I guarantee you when you blend all those yummy vegetables together and add in some spices, it turns into the yummiest Vegan Cheddar Broccoli Soup you’ve ever had. In fact, my wife declared this her new favorite recipe! To make this soup you’ll need a cutting board, one soup pot, and either a blender or an immersion blender. I have to say, my wife spoiled me this year on my birthday by buying me an immersion blender – and it did the trick perfectly! Start by cleaning and chopping a medium head of Cauliflower. Break apart the florets and discard the thick core. Add the Cauliflower pieces to your soup pot with 4 cups of Low Sodium Vegetable Broth. Add 1/4 of a roughly chopped onion, 3 stalks of chopped celery, 1 chopped Yukon Gold Potato, and about 1 cup of shredded carrot. Bring that to a boil and cook for 15-20 min or until the veggies are nice and soft. Now we need to blend this soup base until it’s nice and creamy. You can use your blender, just make sure to do it in small batches and be aware of the pressure that usually builds up while blending hot soups. The other option is to use an immersion blender. This is simply a blender on a stick that you immerse right into your pot. It sure makes blending hot soups easy and I can’t recommend one enough. The following link is for the Kitchen Aid Immersion Blender I received on my birthday. Keep in mind this is an affiliate link – so I will make a small commission if you buy one. Once your soup is completely blended (some small chunks of carrot or celery are fine), let’s start adding our milk and seasoning. Add the Almond Milk, Nutritional Yeast, Garlic Powder, Salt, Pepper, Lemon Juice, Apple Cider Vinegar, and Thyme and stir well to mix. You can make minor adjustments as necessary for your own individual taste. Once you get it just right – add in a 10oz bag of Frozen Broccoli Florets and cover. Let it simmer on low heat for 5-10 min until the broccoli is heated through. Serve with a thick slice of your favorite crusty bread and enjoy! 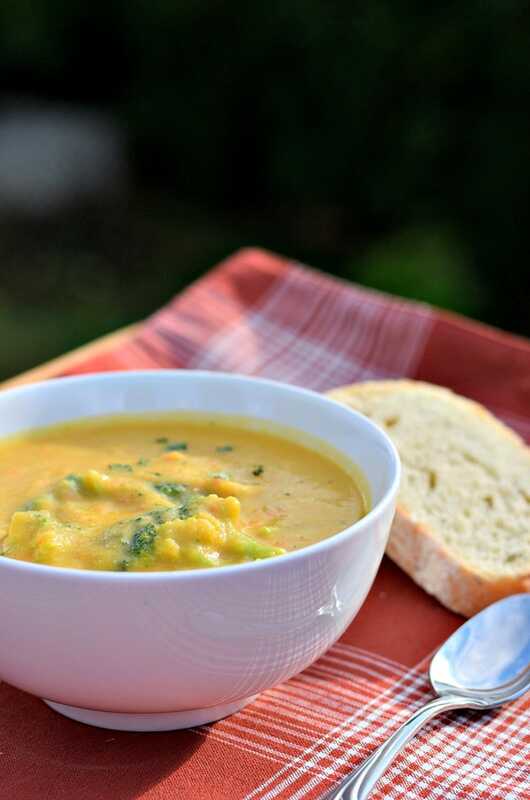 This Vegan Broccoli Cheddar Soup is perfect for those chilly Fall afternoons. A true comfort food favorite with all the original flavor but only a fraction of the calories and fat. Chop all vegetables (except broccoli) and add to soup pot. Add 4 cups of Vegetable Broth and bring to a boil. Cook until vegetables are soft and then carefully blend soup using blender or immersion blender. Stir in milk and all seasonings and mix well. This is so healthy. Not ony has broccoli but cauliflower too. I will try this today. Making this for lunch today. Thanks for the recipe! The yeast is not what one typically thinks of if you are thinking of the type that is used in bread making. It’s deactivated & used as a food product in recipes or as a condiment. For many, it has a cheesy, nut type flavor & used as a cheese substitute in vegan recipes. I really like it & always have some on hand. I’ve made this soup twice and both times it was delicious ?! Today I took about 1/2 of the soup and made broccoli – cheese rice casserole. I added 4 cups of cooked rice, sautéed onions, bell peppers, and celery (the trinity) to 3 cups (not sure if that’s exact ) of the soup. I also added about 1/2 garlic powder and 1/4 cup nutritional yeast. I mixed it well in a Pyrex dish, covered it and microwaved it on 30% for 45 minutes. It was so good. Not quite as gooey and rich as my mother’s made with velveeta. But I can eat 2nd or 3rd s and not worry about Keeling over from all the fat and chemicals! Very good! I used a little less vinegar and a little more salt. Delicious – adding to my rotation! Oh my! It’s raining today and I’m going to make this for dinner! And that immersion blender looks AWESOME! It does so much more than just blend. Thanks for recommending it; I’m a kitchen tool addict. How much does this make? It looks delicious! 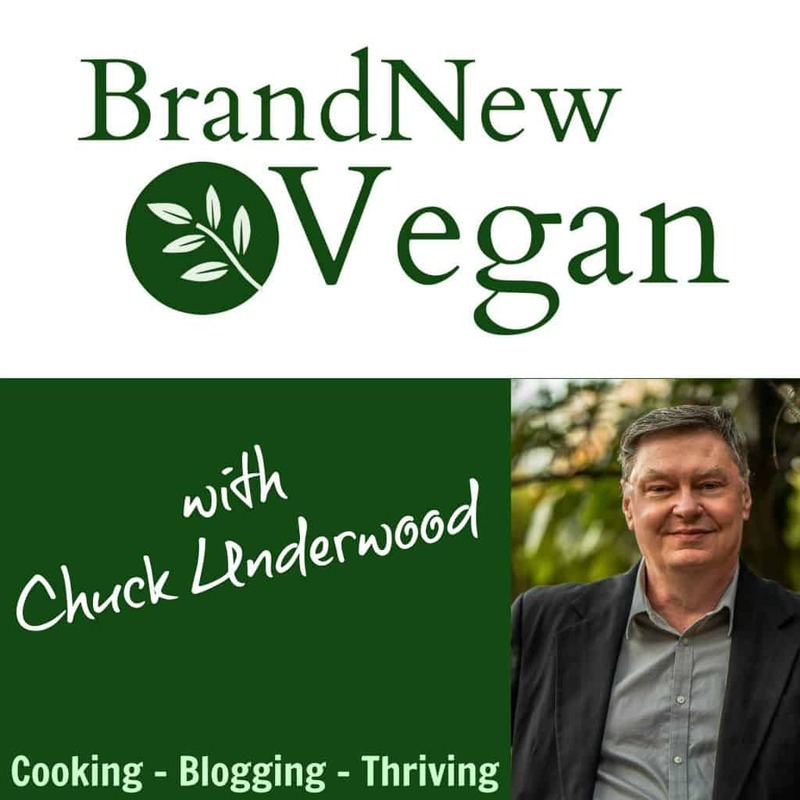 Should I use flakes or powder nutritional yeast? Thanks. I always use flaked nutritional yeast. I made this and I think it is too acidic. I followed the directions exactly. Is there a way to fix it? OK, so…I’m on my second bowl. This was a great addition to the vegan recipe repertoire. I added a small amount of vinegar and lemon juice to brighten it up a little and used a red potato. It worked out just great. Thank you! delicious soup! I felt I could taste the ACV a little to much though – so next time (and there will be a next time) I will try halving the recommended amount. Love most all your recipes! Keep up the great work! How many servings would you say this recipe makes? At least 4 – probably more like 6. Depends on your serving size. Wow! Our family is transitioning toward more vegan meals. This was my first time using a substantial amount of nutritional yeast in a recipe. I have at least one very particular eater who is skeptical of unfamiliar textures or flavors. This soup was awesome and everyone in the family liked it. I added the cider vinegar at 1/2 teaspoon at a time until it had the right amount of tang (like a sharp cheddar.) I didn’t have lemon juice and the flavor didn’t seem to be missing anything but I’ll try it with the lemon the next time. With some warm bread, this was a super delicious vegan meal! So good – especially the next day, after the flavours have had a chance to meld. Thanks for sharing! 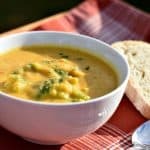 I stumbled upon this recipe in my efforts to satiate a major broccoli cheddar soup craving…without feeling insanely guilty afterward. Hands down, far and away COMPLETELY hit the spot! I did amend it a bit to utilize on-hand ingredients: I was low on veggie broth so subbed half ckn broth to get my 4 full cups. Also added 1/3 c. Soaked cashews as I cooked the veggies, so I could get the full creaminess/thickness. I was hoping for (but obviously it also upped fat content). The two of us polished this off in 2 days flat, and been craving ever since. About to make it again! Thanks for sharing your awesome recipe!! This came out a little sour tasting to me so I doubled the nutritional yeast and that helped. Perhaps it was the lemon I used? My son and husband didn’t care for it but it grew on me the more I ate it. I’m on my 3rd bowl now! I will probably try the recipe again and add the lemon little by little. My family loves this recipe. I put the broccoli in with the other veggies and blend it in so there are no chunks of broccoli. 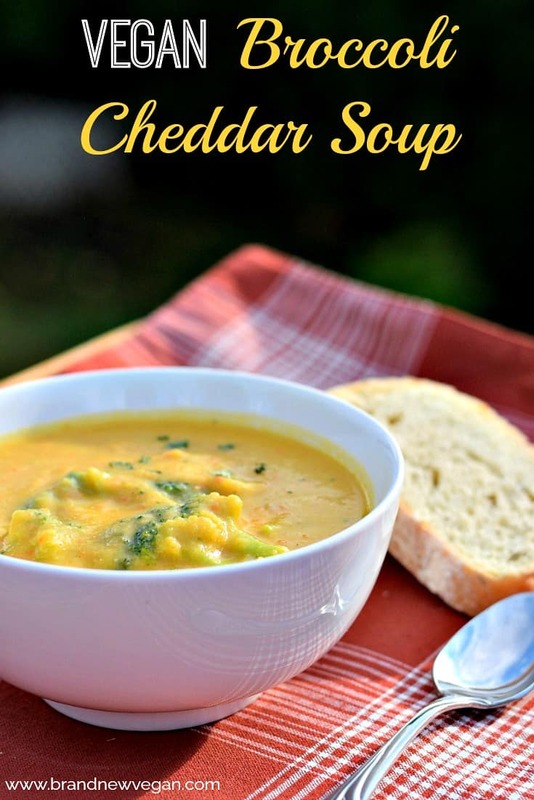 Really satisfies our cravings for Panera broccoli cheddar soup. Thanks for this great no oil vegan recipe! 2019 Challenge…. How about an Instant Pot Version.? Has anyone tried making this without the nutritional yeast? Wondering how it would work without that ingredient as I am not a fan. Thanks.